Twelve-year-old, dark-skinned Axel Brayburn would make a great spy if he only had the equipment. Since his dad disappeared, Axel has kept to himself playing video games while his mother, mechanic Nedra, works to keep the two of them afloat. Then a high-tech robot calling himself Beast crashes into Axel’s garage. Beast tells Axel of the evil corporation that created him to destroy things—but Beast, a shape-shifting robot, isn’t interested in destruction. Unfortunately, Grabbem Industries and Gus Grabbem Jr. (who’s about Axel’s age) want Beast back…or just totally destroyed. When two fighter pilots fail to retrieve Beast, spoiled, obnoxious Gus Jr., armed to the teeth, goes after Axel and Beast himself. Thank goodness they have mysterious Agent Omega helping them from inside Grabbem Industries. Axel jumps inside Beast’s control center, and the two are ready for some shape-shifting robo-action. 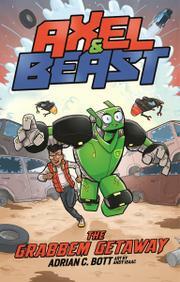 Bott’s first four Axel & Beast adventures, Australian imports, drop together, and reluctant readers seeking uncomplicated adventures will definitely enjoy the liberally illustrated, multifont tales of high-tech robots who fight environment-destroying corporate greed with the help of an introverted preteen. Further adventures visit the Antarctic and the tropics, with even more to come.